Yesterday I found this site, it's a collection of 150 great articles + essays across a range of topics. You can browse by topic or by author. It's terrific. Also this took my fancy this morning, via The Art of Manliness. I haven't looked at the website properly but this collection of vintage photos that show male affection was interesting. Vintage male affection --- 'when real men hold hands'. 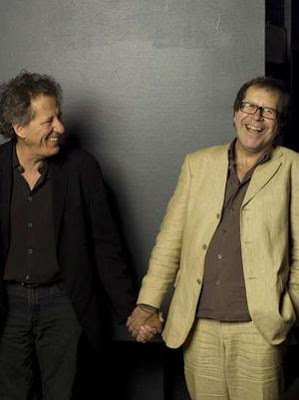 This reminds me of a post I did a few years ago, about a photo of Geoffrey Rush and theatre man Neil Armfield holding hands during the preparation of the production Exit the King. I thought it was a lovely photo, really lovely, and challenges our cultural thinking about male-to-male affection.